Pit Boss Grills, the leading manufacturer of best-in-class grills, announced a smokin’ partnership with Melissa Cookston today. 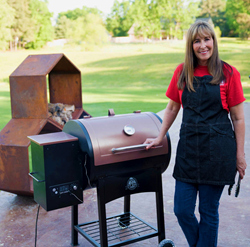 Melissa is the Winningest Woman in Barbecue, a 7-time world barbecue champion, an author, restaurateur, and is now a brand ambassador for Pit Boss Grills and the #PitBossNation. “We encourage our customers to take charge, and to be the boss of their own grill, and Melissa Cookston embodies this message. She will be an excellent addition to our team!" said Jeff Thiessen, President at Pit Boss. Offering the best value per square inch in the pellet grill industry, Pit Boss leads the industry with innovation, excellence, and a distinctly customer-driven approach. Pit Boss takes pride in delivering the best possible products, at an affordable price; crafting grills that are Bigger, Hotter, and Heavier than the competitions. More information on Pit Boss Grills can be found on their website https://pitboss-grills.com/. Melissa Cookston was born and raised in the Mississippi Delta and is a trailblazing female food entrepreneur smoking the competition. Cookston is a seven-time world barbecue champion; owner of restaurants Steak by Melissa, a successful steak house in Southaven, Mississippi and Memphis BBQ Company, a successful barbecue restaurant with locations in Horn Lake, Mississippi, Fayetteville, North Carolina, and Dunwoody, Georgia; an author of two cookbooks, “Smokin in the Boy’s Room” and “Smokin’ Hot in the South;” and a celebrated southern Delta chef. Recognized nationally from many appearances on national news and talks shows as well as cooking shows and the Food Network, Cookston served as a judge on season four of Destination America’s “BBQ Pitmasters,” and was named one of America’s most influential BBQ Pitmasters and personalities by Fox News in 2015. Be the BOSS of your BBQ with Pit Boss Grills. Offering the best value per square inch in the pellet grill industry, Pit Boss is the proud manufacturer of the Wood Pellet Series, the Ceramic Charcoal Barbecue Series, gas grills, and vertical smokers - all at an affordable price, without sacrificing quality! Pit Boss Grills is a subsidiary of Dansons, Inc. which was founded in 1999 by Dan Thiessen and his two sons, Jeff and Jordan. Pit Boss Grills is known for their durability and craftsmanship. From portable grills like the Pit Boss Tailgater, to massive grills like the Pit Boss Austin XL – Pit Boss takes pride in creating the best products in the industry at the absolute best value. Last year, Dansons was awarded EY Entrepreneur of the Year (2017), showcasing its dedication to innovation. For more information about Pit Boss, please visit one of the websites below.